Over the recent decades, countries that have adopted the inflation targeting framework have achieved success in price stability. In fact, this regime has replaced its alternatives, including exchange rate target, monetary aggregates target and discretionary regime. Being clear about the inflation objective, the central banks make it easier for a large segment of the population to be forward-looking and therefore contribute to the shared goal – low inflation. This article covers the principle of inflation targeting mechanism and therefore assesses its effectiveness and benefits as well as possible downsides. ბოლო ათწლეულების მანძილზე ქვეყნები, სადაც ინფლაციის თარგეთირება გამოიყენება ფასების სტაბილურობის მიზანს წარმატებით აღწევენ. ფაქტობრივად, ამ რეჟიმმა ჩაანაცვლა გაცვლითი კურსის თარგეთირება, მონეტარული თარგეთირება და დისკრეციული რეჟიმი. მიზნობრივი ინფლაციის გამოცხადებით ცენტრალური ბანკები აღწევენ ცნობიერების ამაღლებას საზოგადოების ფართო სეგმენტში, რაც საერთო მიზნის – დაბალი ინფლაციის მიღწევას უწყობს ხელს. სტატია განმარტავს ინფლაციის თარგეთირების ფუნქციონირების პრინციპს და აფასებს როგორც მის ეფექტიანობას, ასევე ნეგატიურ მხარეებს. The first three countries to implement fully-fledged inflation targeting were New Zealand, Canada and the United Kingdom in the early 1990s, although Germany had adopted many elements of inflation targeting earlier. Additionally, several emerging market economies adopted inflation targeting after the 1997 crisis, which forced a number of countries to abandon fixed exchange rate pegs and since 2009, the monetary policy of the National Bank of Georgia has also relied on inflation targeting. Many central banks adopted inflation targeting as a pragmatic response to the failure of other monetary policy regimes, such as those that targeted the money supply or the value of the currency in relation to another, presumably stable, currency. 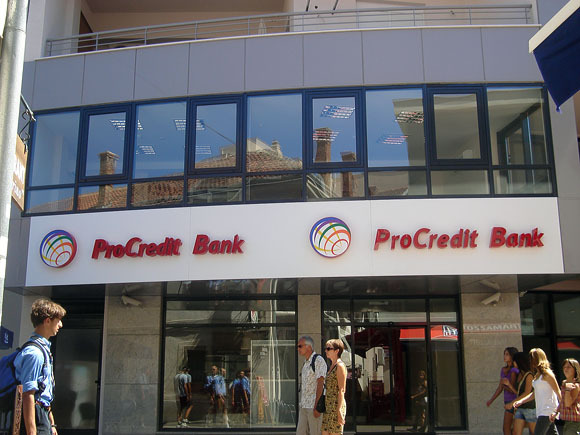 For instance, the central bank of Georgia relied on monetary targeting, which intended to ensure the desired growth rate of monetary aggregates. In monetary targeting, the National Bank of Georgia used the money supply as an intermediary link for controlling inflation. Figure 1. 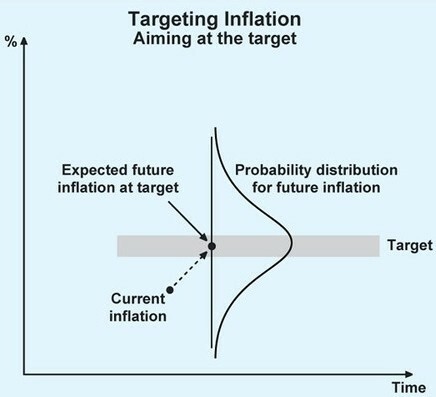 How the inflation is targeted and probability distribution for future inflation. On the other hand, the announced inflation target enables the main objective of the central bank to be precisely defined and expectations about the possible directions of monetary policy to be formed. 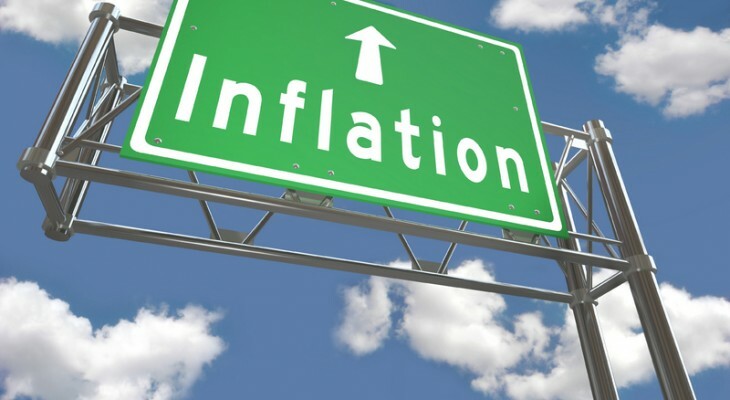 As inflation expectations is one of the key factors that determine inflation, the main goal of the policy makers is its formation to make the economy do better. 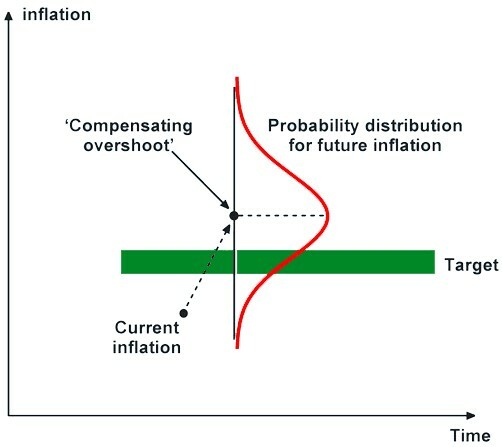 Figure 1 visualizes the process of targeting the inflation. In this regime the announced of the quantitative inflation target represents the optimal rate of inflation for the short term where the probability distribution function provides the different possible outcomes of future inflation. Consequently, the short-term impact is transmitted to long-term, rates of commercial banks and ultimately affects aggregate demand in the economy. Inflation targeting has many advantages as a medium-term strategy for monetary policy. In contrast to an exchange rate peg, inflation targeting enables monetary policy to focus on domestic considerations and respond to shocks to the domestic economy. In contrast to monetary targeting, inflation targeting has the advantage that a stable relationship between money and inflation is not critical to its success: the strategy does not depend on such a relationship, but instead uses all available information to determine the best settings for the instruments of monetary policy. Another key advantage is the Credibility. If an independent Central Bank makes a commitment to keep inflation at 3%, people will tend to have lower inflation expectations which make it easier to keep inflation low. It becomes a self-reinforcing cycle – if people expect low inflation, they don’t demand high wages; if firms expect low inflation, they are more conscious of increasing prices. With low inflation expectations, smaller changes in interest rates can have a bigger effect. Inflation targeting is also effective due to its clarity. Being easily understood by the public it puts great stress on the need to make monetary policy transparent and maintain regular channels of communication with the society. 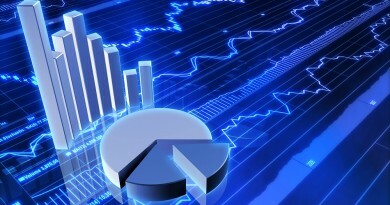 In fact, these features have been central to the strategy’s success in industrialized countries. Inflation-targeting central banks have frequent communications with the government, and their officials take every opportunity to make public speeches on their monetary policy strategy. Inflation targeting central banks, including the National Bank of Georgia have taken public outreach a step further: they publish Inflation Report-type documents to clearly present their views about the past and future performance of inflation and monetary policy. Therefore, the transparency of policy associated with inflation targeting has tended to make the central bank highly accountable to the public. If inflation creeps up, then it can cause various economic costs such as uncertainty leading to lower investment, loss of international competitiveness and reduced value of savings. By keeping inflation close to the target, it avoids these costs and provides a framework for sustained economic growth. In contrast to exchange rates and monetary aggregates, the inflation rate cannot be easily controlled by the central bank; furthermore, inflation outcomes that incorporate the effects of changes in instrument’s settings are revealed only after a substantial lag. The difficulty of controlling inflation creates a particularly severe problem for emerging market countries when inflation is being brought down from relatively high levels. In those circumstances, inflation forecast errors are likely to be large, inflation targets will tend to be missed, and it will be difficult for the central bank to gain credibility from an inflation targeting strategy, and for the public to ascertain the reasons for the deviations. This is especially true in case of communication and forecasting issues. Figure 2. Targeting inflation attempting to compensate for past errors. Moreover, always seeking to offset an undershoot with an overshoot, but not vice versa, amounts to an inflationary bias in policy, and the inflation target would be exceeded, on average, over a long period. As Graph 3 shows, if policy settings are such that the most likely outcome is a target miss, then not only is much of the distribution of likely future price outcomes above target, but there is a 50 percent chance of bigger ‘misses’ than desired. If such a bigger miss occurred, then the policy would be faced with seeking to offset that error – and so on. It is easy to see how this could generate much greater volatility in the real economy, which was not necessary at all for the purposes of maintaining low average inflation. Another shortcoming of inflation targeting is that it may not be sufficient to ensure fiscal discipline or prevent fiscal dominance. Governments can still pursue irresponsible fiscal policy with an inflation targeting regime in place. In the long run, large fiscal deficits will cause an inflation targeting regime to break down: the fiscal deficits will eventually have to be monetized or the public debt eroded by a large devaluation, and high inflation will follow. Absence of outright fiscal dominance is therefore a key prerequisite for inflation targeting, and the setting up of institutions that help keep fiscal policy in check are crucial to the success of the strategy. Similarly, a sound financial system is another prerequisite for successful inflation targeting because when financial systems blow up, there is typically a surge in inflation in emerging market countries. Finally, a high degree of dollarization (partial) may create a potentially serious problem for inflation targeting. In fact, in many emerging market countries the balance sheets of firms, households and banks are substantially dollarized, on both sides, and the bulk of long-term debt is denominated in dollars. Because inflation targeting necessarily requires nominal exchange rate flexibility, exchange rate fluctuations are unavoidable. Inflation targeting has proved successful in a growing number of states and many more countries are moving towards this framework. The Inflation objective works so well because it gives consumers and firms a benchmark for wage and pricing decisions over any relevant horizon. By being very clear about the target, the central bank concentrates and specifies inflation expectations and consequently manages to lower its volatility. Obviously, there are a multitude of benefits related to this regime of monetary policy, including clarity, transparency, credibility with the public, high level of expectations control, increased responsibility of the central bank and so much more. However, this does not necessarily make the inflation targeting an ultimate framework due to the challenges it faces in terms of communication, forecasting, fiscal dominance, exchange rate fluctuations and etc. It is therefore recommended for Individual countries to assess their economies to determine whether inflation targeting is appropriate for them or if it can be tailored to suit their needs. 1. Sarwat Jahan. “Inflation Targeting: Holding the Line.” 2017. 2. Scott Roger. “Inflation Targeting at 20: Achievements and Challenges.” 2009. 3. William T. Gavin. “Inflation Targeting: Why It Works and How to Make It Work Better.” 2003. 4. Hammond, Gill, 2011, “State of the Art of Inflation Targeting,” Centre for Central Banking Studies Handbook. 7. Roger, Scott, 2010, “Inflation Targeting Turns 20,” Finance & Development. 9. Glenn Stevens. Speech. “Six Years of Inflation Targeting.” 1999. 10. Frederic S. Mishkin. “Inflation Targeting in Emerging Market Countries.” 2000.